We thank the good folks at Crysalinks for the following information. See the Aliens in the bottom right hand side? 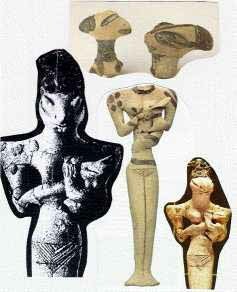 Reptilian looking entities found in Iraq - 5,000-4,500 BC. Figurines, Lizard-headed or Ubaid Style, clay, Ur (Ubaid culture), 5th millenium BCE, h:13.6 cm From the Ubaid - Southern Mesopotamian Period, 5000 BCE - 4000 BCEFound in Ur. The Ubaid culture succeeded the Halaf at the end of the 6th millenium BCE in southern Iraq, then spread throughout Mesopotamia. Ubaid culture is known for painted pottery; large houses of tripartite plan for extended families; and lizard-headed figurines of both male and female gender. 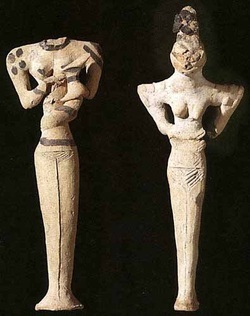 Figurines such as the above examples are typical. The figure on the left holds a baby on her hip and suckles it. The figure on the right has incised stretch marks on her abdomen. It has been suggested that the brown-painted dots and lines represent tatoos, and the clay pellets scarring. It is unknown if the shape of the skulls represents actual head-binding.Similar Lizard-headed figurines have been found at Eridu. Collon, Dominique. Ancient Near Eastern Art. Berkeley: University of California Press, 1995, pg 46. 7,000 B.C. - The Lolladoff plate, discovered in Nepal, appears to show a hovering disk-shaped object in the center and a small being, resembling an alien resembling an alien gray, beside it. The circular pattern is reminescent of the spiraling movement of consciousness - Golden Ratio - Sacred Geometry of creation. 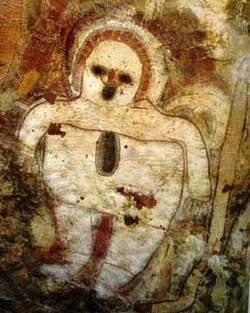 This cave painting is c.10,000 BC and is from Val Camonica, Italy. 7000 year old petroglyph discovered in the province of Quer�taro, Mexico in 1966. 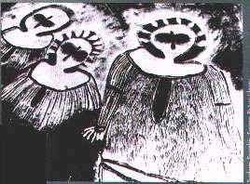 There are 4 figures with outstretched arms below a large oval object radiating what appear to be beams of light. Sego Canyon, Utah. Estimated up to 5,500 BC. Petroglyphs dating back thousands of years ago by ancient Indians in the American Southwest. According to Indian folklore, two objects collided high in the sky and one crash-landed in the region of Death Valley. Some men arrived (presumably in another ship) and spent some time repairing the damaged craft and were observed by the local Indians. The two images below may possibly depict the ship (left) used by the men who came to repair the damaged craft. In comparing the two images, the one on the right seems to depict structural damage around the edges and the bottom. Could it be the one that allegedly crashed? The images are stills taken from an old TV series entitled "In search of..." hosted by Leonard Nimoy. 6000 BC from Tassili, Sahara Desert, North Africa. This is an old Chinese illustration from a fictional book entitled "Illustrated Survey of Weird Countries" (c.1400 A.D.) and had the following original caption: "Ji Gung Land: The people could make flying cars that travelled far with a suitable wind. In Tarng's day (c.1700 B.C. ), Ji Gung people flying a car on a westerley reached Yew Jo. Tarng dismantled their car so it could not be demonstrated to the people ... Later an east wind came on which he had them fly the car back to their own country [5,000 km] west of our gateway." This is an artistic reproduction of a relief found in a labyrinth on the island Jotuo in the Toengt'ing lake. An expedition took place in 1957 (two years before an earthquake in that region). The expedition was led by professor Tsj'i Pen-Lai. They found various reliefs showing "humans" in strange clothes which looked like astronaut suits (hose like objects attached to the clothes). They also found a painting which apparently resembled the solar system. The third and fourth circle (planet) were connected with a line. Also there were ten planets (excluding the sun as planet). This connects easily to the theories about Nibiru, planet X, etc. This is a tapestry called Summer's Triumph It was created in Bruges in 1538 and presently resides at the Bayerisches National Museum. You can clearly see several disc shaped objects in the top of the tapestry. Illustration depicts a sighting by two Dutch ships in the North Sea of an object moving slowly in the sky. It appeared to be made by two disks of different size. The source for this account is one of the books entitled Theatrum Orbis Terrarum by Admiral Blaeu. These books were compilations of articles by different authors and consisted of detailed accounts of long engagements at sea, cartography information, etc. In France there was a coin minted in 1680 that shows a hovering disc shaped UFO with what appears to be port holes or lights around the outer rim. Due to the fact that a coin was minted depicting this UFO. in a book by Roman historian Julio Obsequens. November 4, 1697 - Wheels - Spoked Wheels. 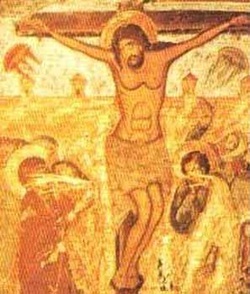 17th century fresco of the crucifiction - Svetishoveli Cathedral in Mtskheta, Georgia. 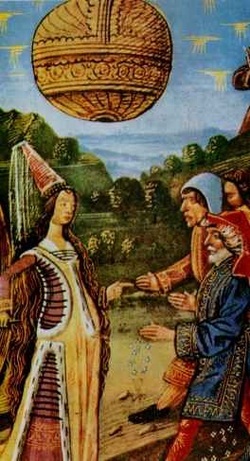 Note the two saucer shaped craft on either side of Christ. Frescos throughout Europe which reveal the appearance of space ships in the skies including this painting of 'The Crucifixion' - painted in 1350. 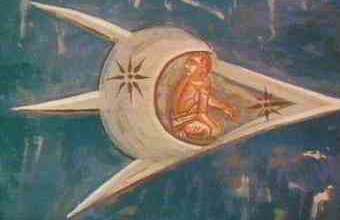 It seems to depict a small human looking man looking over his shoulder - at another UFO as if in pursuit - as he flies across the sky in what is clearly a space ship. The leading craft is decorated with two twinkling stars, one reminiscent of national insignia on modern aircraft. This paintng hangs above the altar at the Visoki Decani Monestary in Kosovo, Yugoslavia.